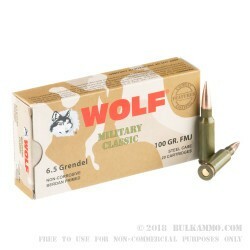 This steel cased 6.5mm Grendel ammo by Wolf gives you an affordable choice for ammunition to fire through your 6.5mm Grendel rifle. 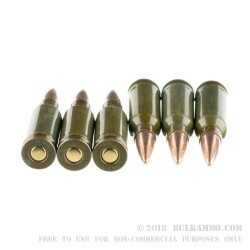 Each steel case is loaded with a 100 grain bimetal jacket FMJ bullet that leaves the muzzle at a velocity of 2690 feet per second. 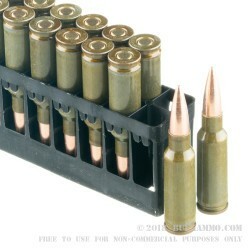 Each round features a non-reloadable Berdan primed steel case and a lead core bullet. This ammo is a fraction of the cost of the brass options in the caliber, and is a great option to shoot in bulk the next time you head out to the range! 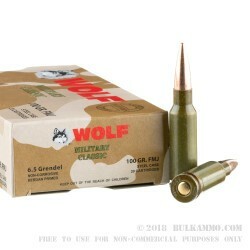 wolf 100 grain steel 6.5 grendel ammo. I was amazed at how fast this ammo shipped. I received the ammo in about 3 days after I ordered. I was quite hesitant to shoot steel out of my rifle but decided to try it out anyway. I shot about 50 rounds at the range without a hiccup. I recently went hog hunting with this ammo and harvested two hogs both at approximately 125 yards that were approx 95 lbs each. Both went down with one shot each through the shoulder.